Ragi is very popular as diabetic food in India, especially in southern India, where it is a common breakfast item served in savory or mildly sweet variations. I get stumped seeing how many ways ragi is cooked in the southern states. So many flavors, so many variations with roasted ragi flour, sprouted roasted or malted ragi flours available in stores and people cooking ragi in diverse ways. Ragi puttu, Ragi dosa, Ragi idli and Ragi mudde is so very common there. I tried everything and loved them all, but somehow could never develop a liking for ragi mudde. May be I didn't cook it right. I have been baking ragi breads, ragi cakes, ragi crackers and even cookies with ragi since I started cooking and baking myself, I remember my grandmother used to make laddus with ragi and nuts with loads of ghee in them. You can always steam some idli using ragi as well, I find it really easy to incorporate ragi in day to day cooking. one for it's high fiber content (intake of 25 g of dietary fiber per 1000 calories/day is considered optimum for a diabetic) which is great for all of us...and secondly for being a complex carbohydrate (low GI ) food. Complex carbohydrates are the ones who take more time to be broken down into glucose, so glucose is released into blood slowly if complex carbs are consumed, this is a key point in management of post-prandial blood glucose. It should be noted that diabetics need not restrict their carbohydrate intake, but they can alter the type of carbs in their diets. Complex carbohydrates are the answer, good sources are all whole cereals, pulses and vegetables, and some fruits. Glycemic Index is a good criteria to choose cereals for diabetics as well as sedentary people. Glycemic Index ( GI ) is the numerical index given to a carbohydrate rich food that is based on the average increase in blood glucose level occurring in blood after the food is eaten ( pp blood glucose ). The higher the number, the greater the blood sugar response. Low GI food is preferred for diabetics and ragi proves to be perfect for being low GI food and for being rich in fiber. This grain is also rich in calcium and phosphorous, protein and some iron too and hence it is a good food choice anyway. The fact that it is rich in an essential amino acid called methionine (which many other cereals lack) makes it an even better food for the general people too. 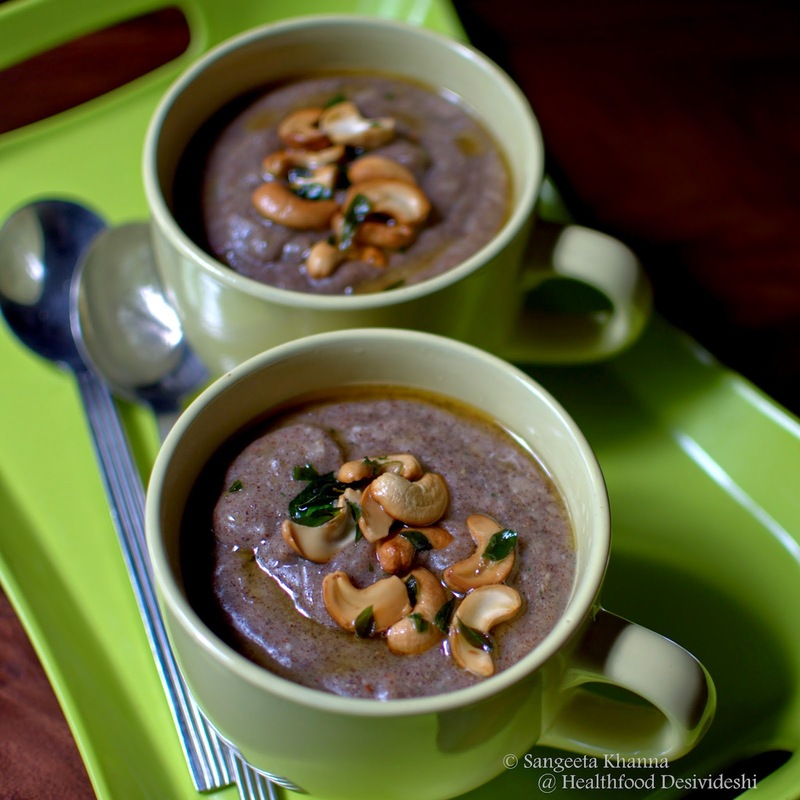 And now we come to this simple recipe of a savory porridge with ragi, which is fortified with coconut, curry patta, some ghee and nuts to make it a complete meal in itself. Make a paste of coconut, cumin, ginger, 3 springs of curry leaves, peppercorns and salt. Make a slurry of ragi and water in a thick base pan, add the paste to this slurry and place the pan over stove. Cook while stirring with a wire whisk all the time. It will take about 6-8 minutes to get thick and porridge like consistency. You can add some water to make the porridge thinner if you wish. Take off heat once the porridge gets cooked. Some bubble forming and bursting with a puffing sound is the indication of the porridge getting cooked. It takes about 8-10 minutes total to get cooked. Fry the cashew nuts along with 2 springs of curry leaves in ghee. Pour it over the ragi porridge and serve hot or warm. 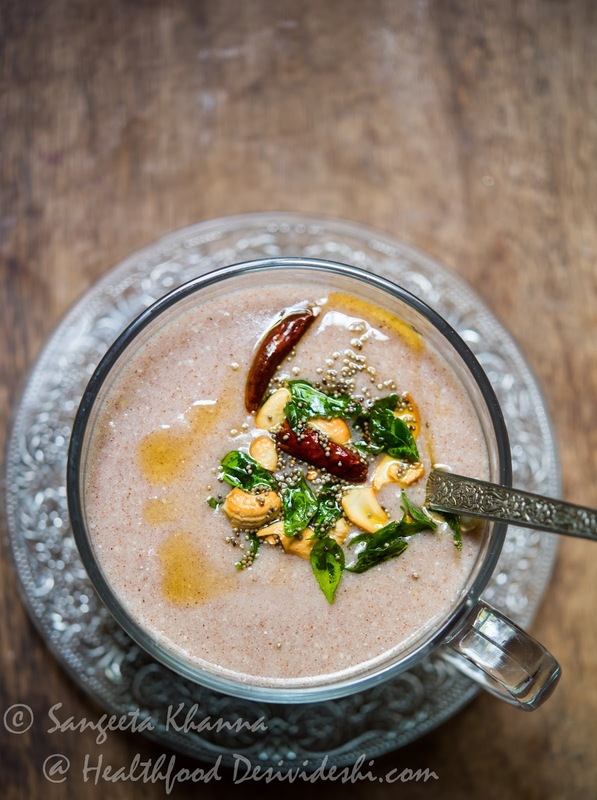 I love the flavors this ragi porridge packs, coconut, curry leaves, cumin and ginger make this porridge spicy enough to energize for the day, the porridge is filling and keeps you full till lunch time. Those fried cashews would be lovely if you break them in smaller bits and mix with the porridge, those nutty bites in between is a great surprise with porridge texture. The texture of this ragi porridge is almost like any plain oats porridge. You can always replace ragi with oats if you don't get ragi in your part of the world, or just use any millet flour you have access to. I would love to experiment more with ragi mudde. Do you have a fail proof recipe? Please share your ragi mudde recipe with me because I love all kinds of dumplings and have a strong feeling I would love ragi mudde if it is made well. Share your recipe in the comments section please. I am so intrigued by this recipe because Ragi as a porridge I had given to my daughter when was an infant. It was sweet though. This savoury version - I am not able to imagine how it would taste. Would love to try and see how it tastes. I've never tried ragi, except in a bread once. Must make crackers. Muddle I would probably muddle up...LOL! My name is Anu and I work for DNA newspaper in Mumbai. I am writing an article on breakfast items and wanted to talk to you about it. Could you please get back to me at anuprabhakar184@gmail.com asap so that we can take this discussion forward? loved this post. can this exact recipe be turned into a ragi roti. the flavors in this recipe are fantastic, i can never say no to roti .- Kamal. Thanks Kamal. I love these flavors too, and often make a paratha with ragi and a little mashed potatoes added with the same flavors. Try that sometime. Thanks for the suggestion Kasturi. This recipe of ragi upma sounds really nice. Malted ragi flour is superior to regular ragi flour for sure.